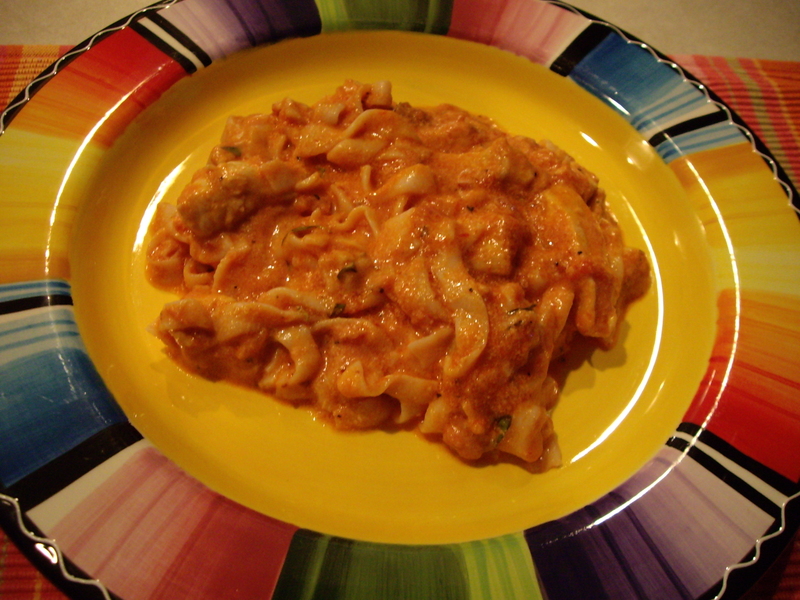 Chicken Penne a la Vodka (minus the vodka) | What's Cooking at the Genua's? Yes, Penne a la vodka with no vodka. I was inspired by chef Rocco DiSpirito with this recipe. It was his originally and I made it my own. He didn’t have chicken in his recipe. He uses whole-wheat pasta and I used my favorite Tofu Shirataki Noodles. Usually this recipe is loaded with heavy cream and vodka, making it very high in calories. This tasted just as good and you will never miss the vodka or cream. Honest! It is much lower in fat and since I have added chicken to mine it’s got more protein. I also added a little more marinara sauce than the recipe calls for so mine is a little more red than normal. Also I used 16 ounces (2 packages) of the Shirataki Noodles, next time I will use only 8 ounces (1 package) Mangia! 1. In a large saucepan sauté the garlic in the oil. When the garlic is lightly browned add the chicken and cook till browned. Remove chicken from pan and set aside. 2. If using whole wheat pasta bring a large pot of salted water to a boil. Add the pasta and cook according to package directions, about 9 minutes. If you are using the Shirataki Noodles follow package directions. 3. Meanwhile, in a large, nonstick sauté pan over medium heat, combine the marinara sauce and red pepper flakes and bring to a simmer. Cook, stirring occasionally, for about 5 minutes or until it is reduced and slightly thickened. 4. Remove the marinara from the heat. In a small bowl, stir about ½ cup of the marinara into the Greek yogurt until it is smooth, to temper it, then whisk the yogurt mixture back into the marinara in the sauté pan. 5. Drain the pasta and add it to the pan, tossing to coat. (or add the Shirataki noodles) Add the chicken and toss to mix. Add the basil and season with salt and pepper, if necessary. Sprinkle with Parmesan cheese. Oh yummy! 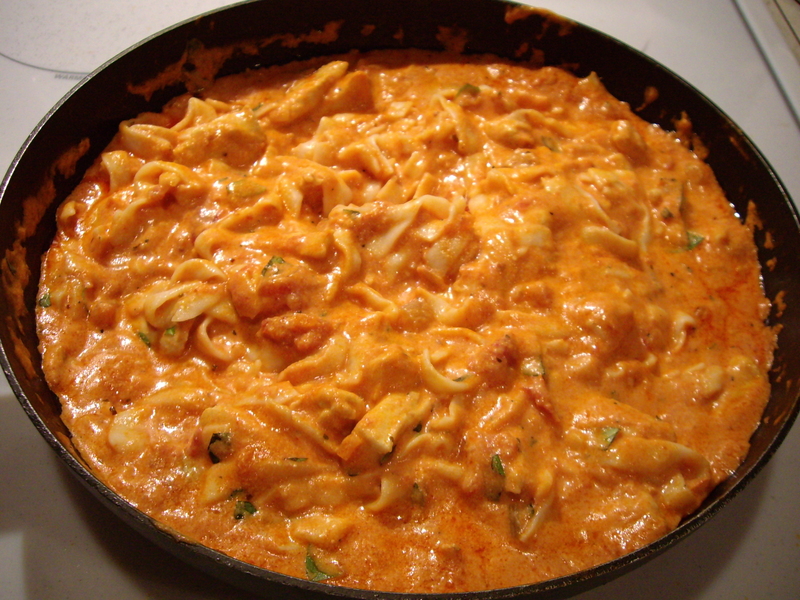 I love substituting tofu noodles for real pasta… and with a tasty sauce like this one, who would know? This has been added to the top of my list of recipes to try!